As reported by Bernama News on 24 Dec, the Iranian oil ministry envisaged investing up to US$50 billion to explore oil and gas fields in the Caspian Sea, a member of parliament, Ali-Asghar Yousefnejad, said on Friday. "In a recent meeting with the oil minister, he explained on plans to explore oil and gas fields in the Caspian Sea," Yousefnejad said. Iran announced on Dec 11 it has discovered a large gas field in the Caspian Sea with at least 50 trillion cubic feet (some 1.4 trillion cubic meters) of reserves. The field, in waters 700 metres deep, lies wholly within Iran's territorial waters, Iranian Oil Minister Rostam Qasemi said. 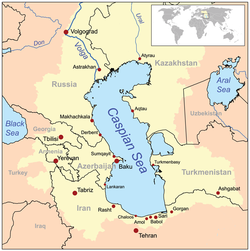 He that added excluding this new discovery Iran has 11 trillion cubic meters of proven gas reserves in the Caspian Sea. Previously, deputy oil minister Mohsen Khojaste-Mehr told that extensive operations are underway to explore new gas deposits across the country which will probably increase the country's proven gas reserves. The Fifth Five-Year Development Plan (2010-2015) has envisaged boosting the country's gas production by 250 million cubic meters per day to reach 1.4 billion cubic meters per day. Iran holds the world's second-largest gas reserves after Russia, according to the BP Statistical Review of World Energy in June.